After a couple of lackluster weekends, Niels Albert (BKCP-Powerplus) outclassed the competition in the final GVA Trofee race in Oostmalle. Albert saw the front of the race for the first time after forty minutes and, unfortunately for his competitors, didn’t see a wheel in front of him for the rest of the race. 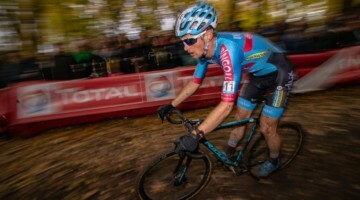 His technical proficiency in the sandy corners and slimy quasi-singletrack sections proved too much for an obviously strong Zdenek Stybar (Quickstep) and smooth Kevin Pauwels (Sunweb-Revor). Specks of rain blurred the lenses of the TV cameras as Jim Aernouts (Sunweb-Revor) led his teammate Kevin Pauwels through the hole shot. A mixture of bare legs and full leg warmers could be spotted in the peloton, showing the mixed approaches to the start of Belgium’s uneasy transition from deep winter to wet and windy spring. Pauwels soon took over the front of the race, his easy lines through the corners belying the greasiness caused by several days of light rain and mild temperatures. Aernouts slipped to third and was seen to plant his feet several times in the woods. Pauwels took the opportunity to test the field, putting eight seconds into the field by the time he crossed the Start/Finish line. Sven Vanthourenout (Landbouwkredeit) was at the head of the chase as it rounded the corner on to the finishing straight, but Stybar and Tom Meeusen (Telenet-Fidea) took advantage of much head-turning and soft-pedaling to start the chase in earnest. Stybar quickly opened a gap over Meeusen, and behind them both Sven Nys (Landbouwkredeit) and Niels Albert took bike changes. The now alone Stybar rapidly gained ground on Pauwels, although the catch wouldn’t occur until the middle of the next lap. Pauwels started the third lap with four seconds advantage over the Czech, while the rest of the chase muddled along 16 seconds behind. Nys and Albert could be seen near the back of a seven man group, but only Albert took the initiative to move up through the chase. He stole two place before the sandy run, by the end of it he led it. 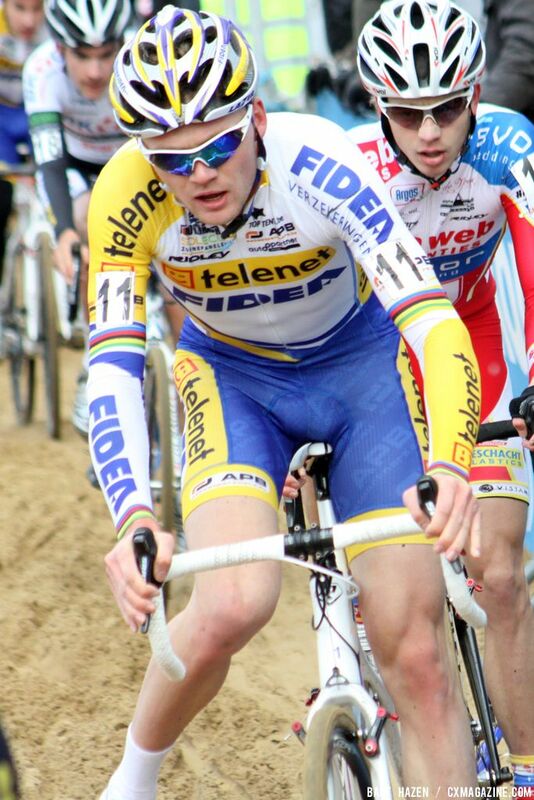 Soon he and Meeusen opened up, crossing the Start/Finish 18 seconds down on the leading pair. 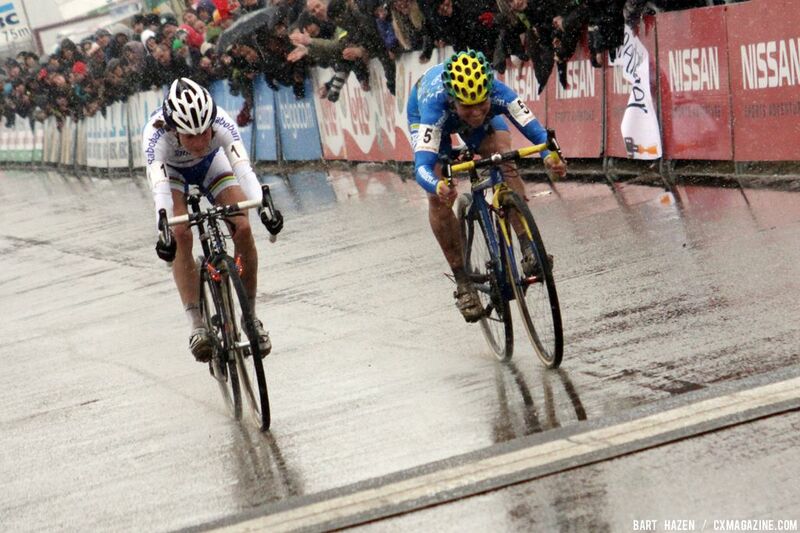 The rain changed from drizzle to downpour as Stybar moved to the front. 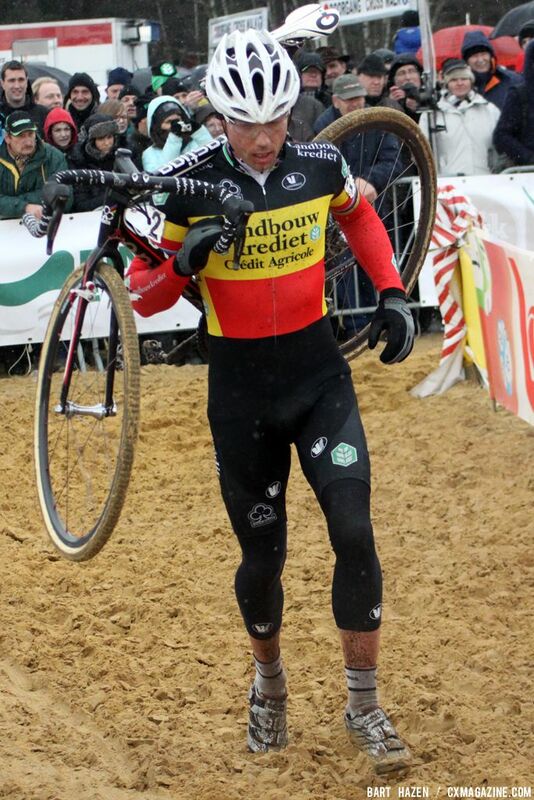 He attacked early in sixth lap, Albert struggled to hold Pauwels’ wheel in the chase. 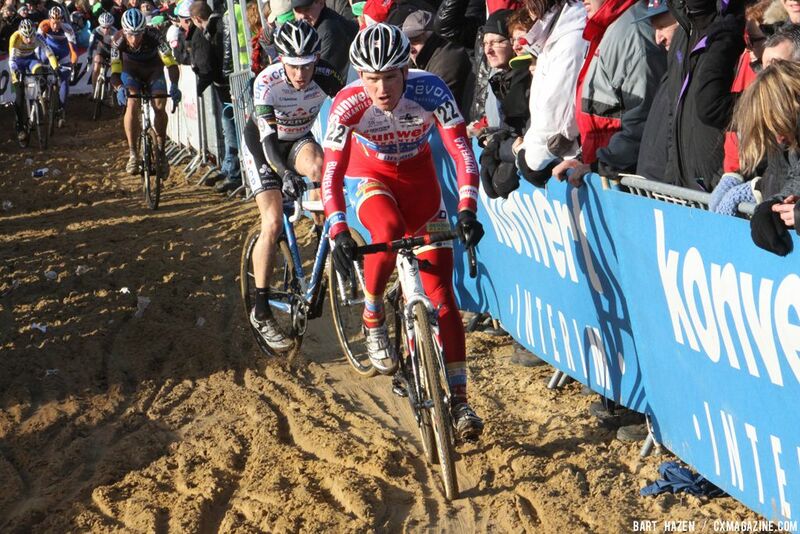 Stybar’s time at the front ended when he misjudged the two rideable sandy hairpins that follow the runnign section. He lost about a second of his advantage in the first, but exited the corner with almost no leg speed, ensuring that he would be caught by the time he left the second. The seventh lap started after just shy of 40 minutes racing. Albert moved to the front for the first time in the race and played his had. Stybar was still recovering from his attack in the previous lap and Pauwels looked to be blunted by the best part of 30 minutes of setting the pace. 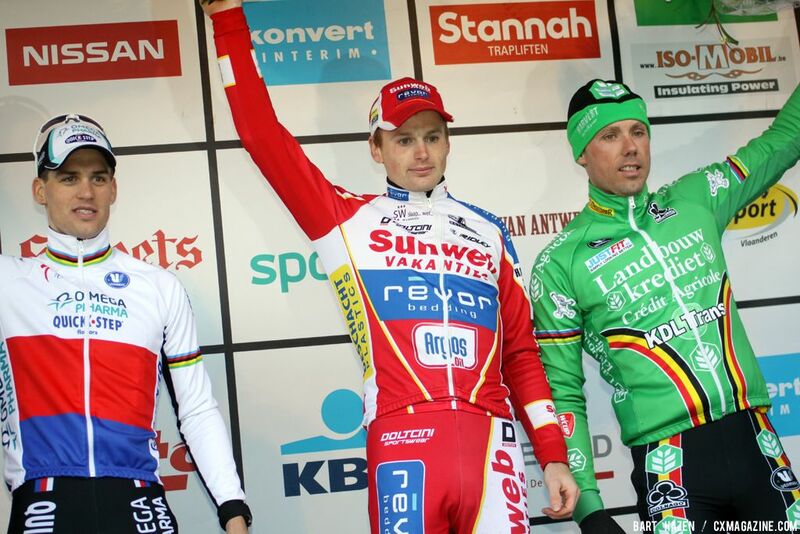 Albert’s attack immediately caused problems for the other leaders; Pauwels pulled his foot out of his pedal, Stybar nervously threw himself into every corner to limit his losses to just four seconds to Pauwels. Albert completed the seventh lap in a day’s equal best of 6:16″, impressive considering how the ever-intensifying rain had changed the course by this point. The same changes caused Stybar to follow new lines through the woods, seeking rougher ground with more traction than the slick mud. 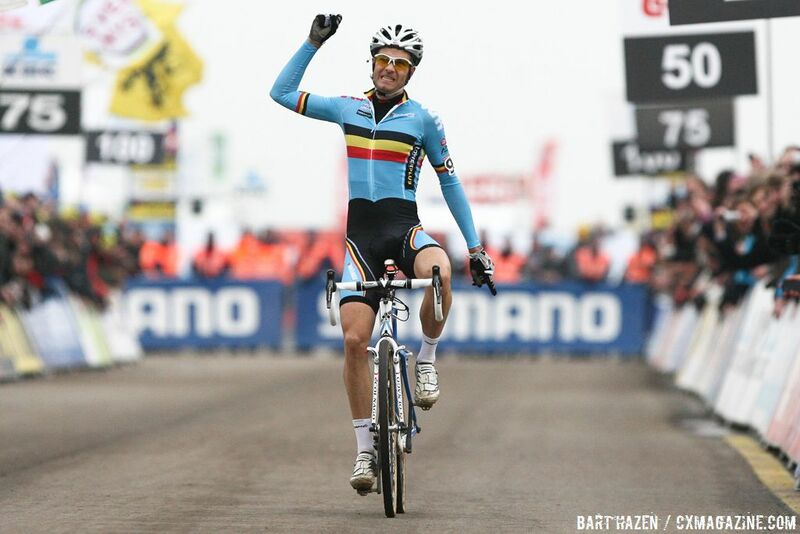 He overcame Pauwels, but his pedal stomping couldn’t challenge the consummate cornering of Albert. 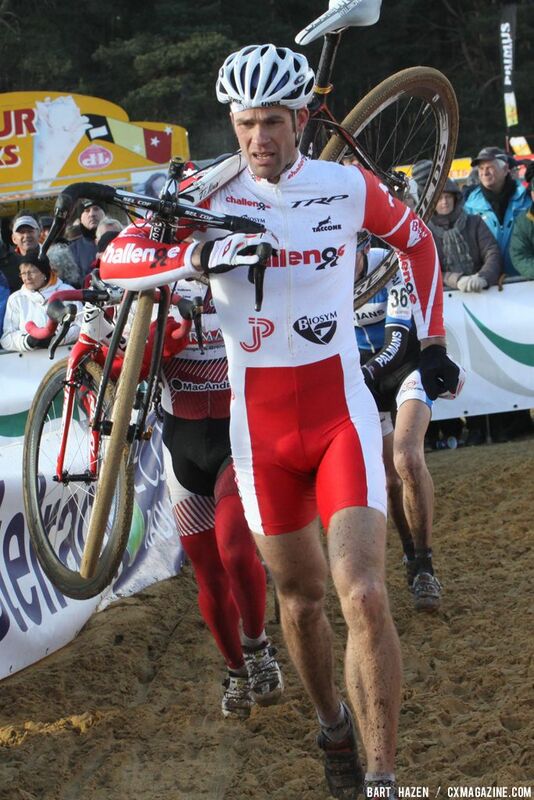 As the three riders exited the woods for the penultimate time their faces defined their styles: Albert’s mouth agape from putting out a couple of massive laps; Styabr, almost 10 seconds down, grimacing as he honked his bike back and forth; Pauwels placid in the knowledge that a third place would secure his overall title. After he took the bell, Albert relaxed a little bit as the crowd applauded his ride. His flawless last lap took north of seven minutes, but he still had time to spare in the final straight. In a momentary lapse of “pro etiquette,” he saluted before fully zipping up his jersey. 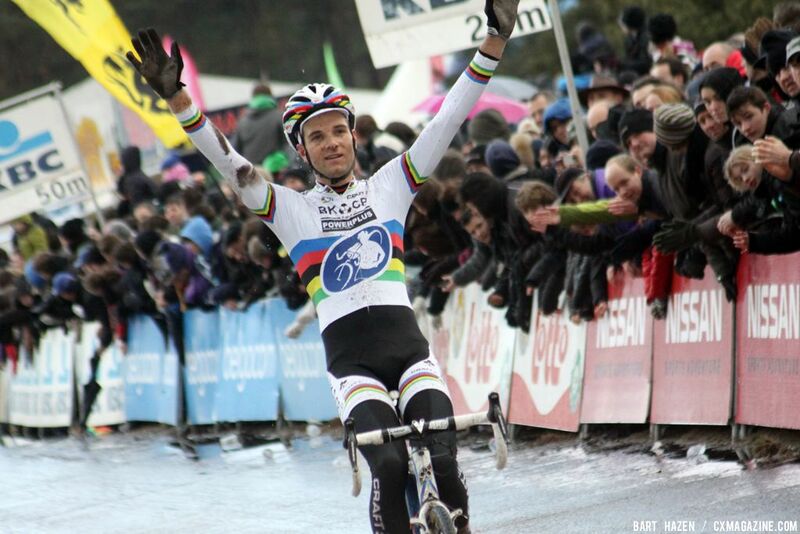 He rectified this before crossing the line, showing the rainbow stripes in the last major race of the season. 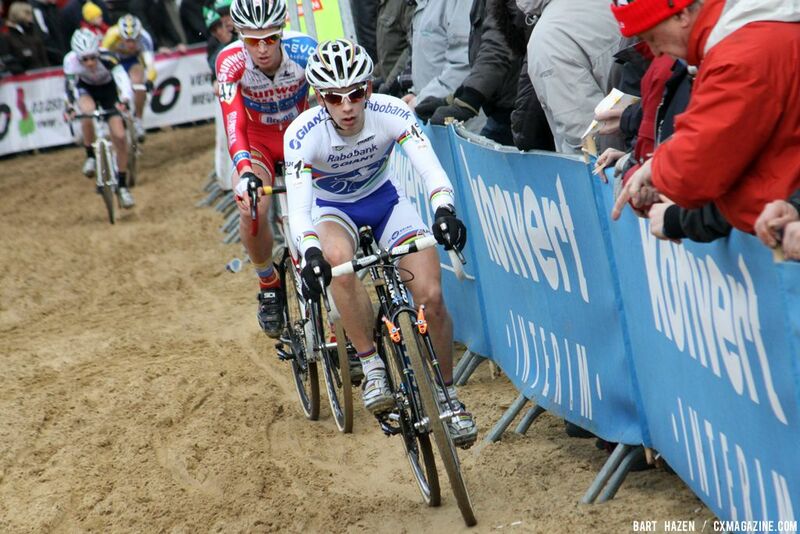 Waves were had from Stybar in second, and overall winner Kevin Pauwels in third. 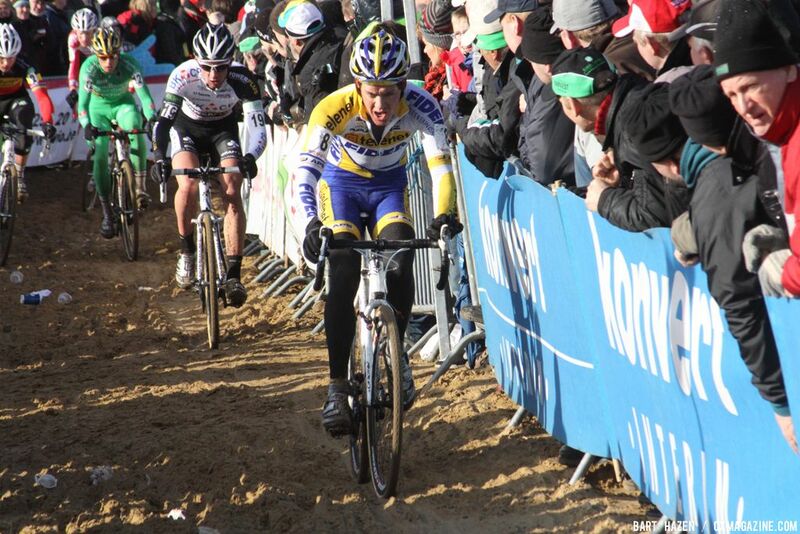 Sven Nys soloed home in fourth, having had an anonymous race probably caused by fatigue from the previous day’s win. 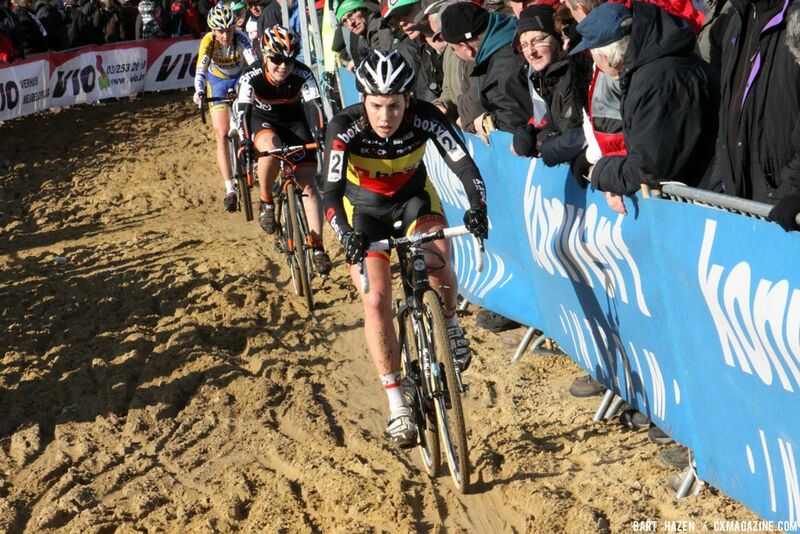 Daphny Van den Brand (AA Drink-Leontien.nl) won her last ever professional cyclocross race at Sunday’s GVA Trofee in Oostmalle. 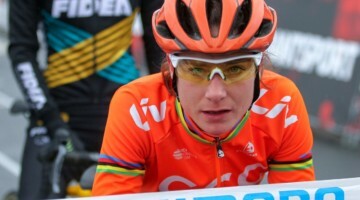 She out-sprinted the usually dominant Marianne Vos (Rabobank) in a two-up sprint after escaping with the World champion in the first lap of the race. To honor the retiring former World champion, many of the racers in the women’s field wore their hair in twin braids, much to the amusement of Daphny. In a style that has come to define women’s cyclocross this past season, Vos and Van den Brand simply rode away from the rest of the women’s peloton. Vos did the lion’s share of the work throughout the race, with Van den Brand taking the front for only short turns each lap. “Yes, it was,” countered the forthright Van den Brand. Saane Van Passen (Brainwash Wielerploeg) held on to a two second advantage over Saane Cant (Boxx Veldritacademie) to complete the podium.